We are very fortunate that one of the leading UK iconographers, Anthony Beeson, will be giving a talk at Boxford Village Hall on Saturday 3rd March at 7pm entitled The Triumph of Bellerophon. The Boxford Mosaic, a unique survival from Roman Britain. Places will be limited on a first come first served basis because we anticipate a full house. 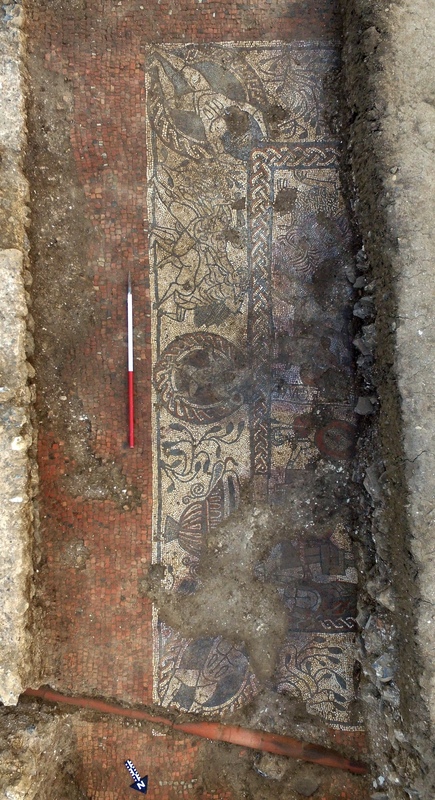 So please reply to joy@appleton.uk.net This mosaic was discovered last summer by locals supported by local archaeological groups, overseen by professionals and has been described by experts as the most important discovery of a Roman mosaic in Britain in the last 50 years. For those of you who might be interested in the background of our speaker, who after his visit to the site last year conducted an incredibly thorough research looking at mosaics throughout the Roman world. Anthony Beeson was born in 1948 into a well established Brighton family. Having worked at the Courtauld Institute of Art Library, he moved to Bristol in 1972 to become Fine Art Librarian, and over the following thirty-seven years developed the Bristol Art Library into one of the finest British public collections of art books. He is a noted classical iconographer who has written extensively in academic journals, lectured on Romano-British art and appeared on the television programme Time Team.